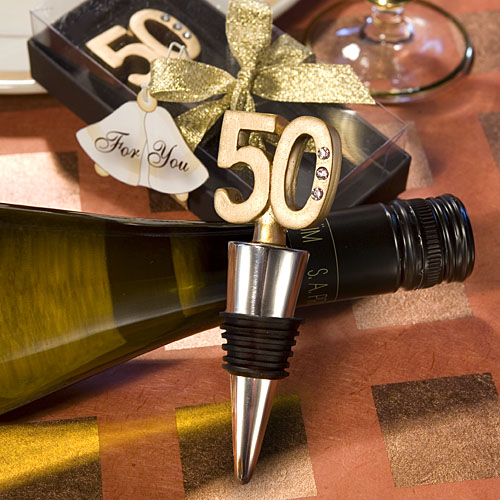 This 50th birthday wine bottle stopper favor is a great way to celebrate the important milestone with guests. Also perfect as golden anniversary favors, each bottle stopper favor measures 4½ x 1½ x 1½ and is made with a sturdy chrome base wrapped with a black rubber gasket. A bold gold three dimensional 50 tops it off, delightfully embellished with three shimmering rhinestones. Each comes packaged in a deluxe clear topped box with a black base, tied with a gold organza ribbon and attached bell shaped thank you tag. This product is sold as an annivesary favor, so many customers cut off the bell tag and order a personalized tag.